Sweet Caylee you are now in the arms of an angel resting peacefully. Never forgotten. I am afraid only you will ever know the whole complete truth of what happen. I am so very sorry such a angel had to have all this happen in the manner in which it did! I loved to hear you sing You Are My Sunshine and asking your Pop was he getting tired. I use to sing it when I was little to my Mom the whole way home from Gam'ma's house. You are for sure a ANGEL and will alway's be in a lot of people's heart for ever! 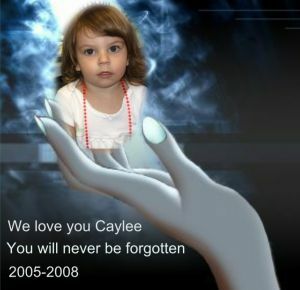 CAYLEE GOD BLESSED THOSE WHO KNEW YOU. WE WERE SO LUCKY TO HAVE KNOWN SUCH A WONDERFUL GIFT FROM GOD. YOU CAN REST PEACEFULLY NOW DEAR CHILD. NO LONGER SHALL YOU FEEL THE PAIN THE WORLD HAS CAST DOWN UPON YOU OR ANY OTHER CHILD AGAIN. YOU SHALL REST PEACEFULLY IN THE ARMS OF GOD. HE LOVES YOU SO MUCH. GOD ONLY KNOWS WHY PEOPLE DO THINGS LIKE THIS. I KNOW YOUR A SPECIAL ANGEL. I LOST MY BABY TWO YEARS AGO, BUT NOT HOW WE LOST YOU. I MISS MY BABY AND I WILL MISS YOU SO. GOD BLESS YOU MY DEAR CHILD. YOU MIGHT NOT HAVE BEEN MY OWN BUT YOUR SPIRIT LIVES ON IN ALL OF US. Sweet Caylee I waited for this day. Now that is has come. My heart is very heavy. But sweetie you are in a much better place. I will miss your presence here. But your spirit is always near.